I tried to connect the pilz PNOZ safety PLC to the Unistream USB Host to exchange data. Unfortunately, this was not succsessful. Windows is using the "usbser.sys" driver to communicate with the pilz PLC (see enclosed picture). I do not know how complex it is to implement this driver in the Unistream PLC. Maybe you can look into it. The communication between the PC and the Unistream with a USB rs232 adapter with the prolific chip is working wonderful :). 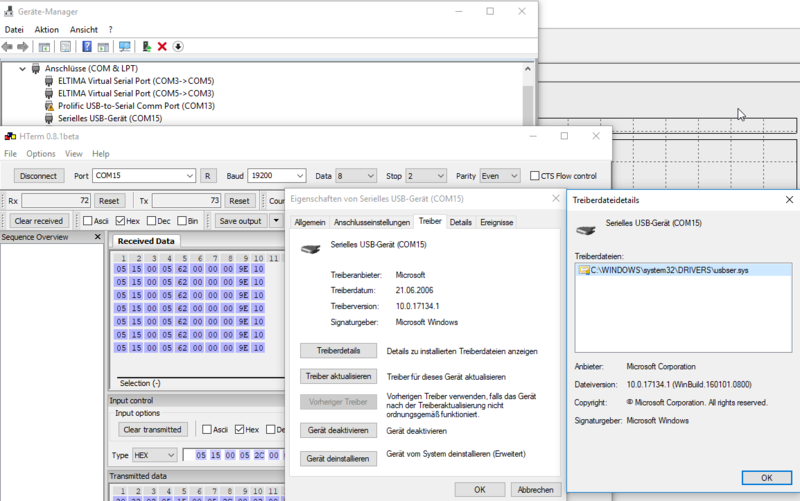 pilz PNOZ mm0p - used USB port only for download project via commisioning software. I think it is impossible to conect this typ of pilz safety module to Unistream. This pilz PNOZ safety PLC is standalone device with dual processor operation working with downloaded via card or usb project. No networking option is offered by manufacturer for this device, or you choosed wrong pilz model. this is not correct. You can exchange data (virtuell I/O's, LED Status and so on) over the integrated USB interface even with the standalone device mm0p (As you can see in the picture of my first post). And this is really graet to exchange information with the main PLC. In this chapter is present only RS232 and Ethernet connection. Please describe you configuration. As i see in your manual mm0p must have communication addon module for RS232 and Ethernet connection. -Read virtual outputs for standard functions. communication module with interface can be connected. Either a serial interface RS232 or an Ethernet interface is integrated, depending on the base unit type or communication module. the integrated interface from Version 1. But you say USB... No USB option is present in manual. USB is used only by commisioning software. Do you whant to use undocumented connection via USB port? This is two option - USB is integrated in pilz main processor (no information about :( ) , or it is separate USB to RS232chip inside used (you must know what chip). In this case maybe only creators can offer driver integration for pilz USB to use it via Unistream USB host. If you use standard pilz connection option module (RS232) - USB to rs232 adapter with the prolific chip maybe work. Or better use much faster Ethernet. You are right that USB is not mentioned in this chapter. But as you can see in the picture of the PNOZmulti Configuration tool you can add virtuel I/O's. And it is working perfectly :). I connected the PNOZ mm0p via a USB cable to my PC (PC is USB Host). Now it is possible to communicate with the mm0p via a termial program (e.g Hterm) as described in the manual. The "only" thing missing is the implementation of the "usbser.sys" driver in the unistram operating system ;). Maybe it is problem with driver :( Only prolific supported.